If you do not want to leave your pet in a cramp kennel cage while you are away on holiday, weekends away, business, or any other reason and be assured knowing that your dog is in a safe nurturing and healthy environment then here is the place! Dogs live in our home as part of the family. We only take one or two dogs at a time to ensure lots of attention, love, comfort, a true “Home from Home” experience, so that the separation between dog and master is as painless as possible. 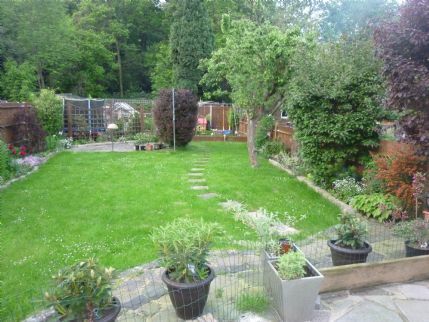 With a large garden, which is very secure to play in, woodland around the corner and only a short walk to the big park for a good exercise your pet will have great fun! All dogs must be up to date with routine vaccinations before boarding. Dogs must also be up to date with worm and flea treatments. We are happy to take on animals who maybe on long-term medication depending on reason for medication. If vet care is needed during boarding, we will try to arrange for animals to see their own vet. If this is not possible then we will take him/her to our own and customer is liable for costs. We left our Labrador Archie with Robert while we went away for two weeks. From the moment we arrived it was clear he was going to be very well looked after and treated as if he was one of the family. He had a lovely garden to play in and a nice sofa to lay on. He came back a very happy and relaxed dog. We will definitely use again and can go away feeling completely at ease leaving Archie behind. I'd also like to add that Robert helped us out at the last minute with Archie when our last 'dog sitter' let us down the day before we were due to fly on holiday. He kept us updated with pictures to put our mind at rest. We left our two dogs twice now with Robert and his family, once for ten days and the other for three. It is a home from home for them and they enjoy going and socialising with Roberts dog and any others, they always come back in great spirits, having been for long daily walks and lots of play time. Would recommend Robert to anyone looking for a safe and happy place for your own dogs, and for full peace of mind. We went on holiday and left our 15 month Shihtzu Oscar for the very first time. We felt very guilty almost as though we was leaving a child! Robert assured us that we have nothing to worry about as Oscar would be in very safe hands and he was true to his word. Robert sent us regular updates on Whatsap to show that Oscar was having a thoroughly good time. Oscar made a couple of new friends and Robert and his family provided him with a real home from home environment. We will have peace of mind when leaving Oscar in future as we know he will be well looked after. Mia stayed here already twice: a week in August, then 16 days in November 2017. Both times she returned home happy. Mia is member of our family, so we were very happy to learn that we may stay in touch with Robert by texts and internet messages - this was really nice and gave peace of mind to know that Mia is OK. She made friends there and had really good and healthy time on her holidays. I can recommend this place as I fully trust them now and won't hesitate to ask them to accept Mia for her next holiday, while we're out in ours. My Cockapoo Pablo, who is a cautious fellow, stayed here in August for 5 days. He came back a happy and well-exercised dog, having had a great time. Robert was friendly, very helpful and professional, and we had no hesitation in leaving Pablo in his care. I would recommend Robert to anyone who is looking for an experienced dog handler in a family home environment. We are just 20 minutes away by train or underground from the Centre of London & 5 minutes away either from Abbey Wood, Welling or Woolwich Arsenal stations.